Develop a Killer eCommerce Digital Marketing Strategy for 2018! So you’re running a successful eCommerce website, but how are you going to look to future expansion? The digital world is overrun with advertising and it can seem almost impossible to stand above the parapet. Even when you do manage to stand out from the crowd, how are you going to ensure that you’ll make that sale, and make sure that they come back to you? Creating a winning digital marketing strategy for eCommerce can be a tricky thing to achieve, and it’s especially hard to know where to start. At Spot Studio, we’ve been developing plans for eCommerce businesses for years and have seen how trends come and go. Gone are the days where keyword stuffing could give you a million visitors a month, and with Google’s constant updates, SEO is a term that has lost the weight it once had. And even if you can get traffic, how do you know you’re getting the right traffic? With the whole expanse of the internet opening up before you, fear not! We have broken it down into easy to digest chunks that will give you a simple and straightforward approach to understanding your generating a digital marketing plan. Where am I doing just fine? Where am I wasting resources? At this stage you need to look at your competitors too; find out what they’re up to and consider why they are doing better than you! It’s all well and good to celebrate your wins, but it’s far more beneficial to focus on your weaknesses at this stage. Be brutally honest with yourself and get the opinion of those who work with and for you. Don’t be afraid of criticism, that’s the whole point of this exercise, and without it you the rest of your marketing strategy will be useless. Perhaps the most important stage of your digital marketing strategy, you need to establish Key Performance Indicators (KPIs). Quite frankly, if you aren’t measuring these KPIs as an eCommerce business, you’re failing. Once you have your KPIs in place, then you need to quantify a realistic increase that you can expect as a result of your marketing plan. Take a look at trends in your data to understand what this might be. For instance if you’ve seen a 2% increase in conversion rate in the last 6 months, it’s probably not very realistic to expect to see 400% growth in the next 6. A conservative, but realistic figure would be around 20%. It’s important at this point to remind you that your digital marketing strategy needs to adapt as time goes by. If you achieve an 80% increase in your conversion rate after month 1, then seek to understand why and adjust your figures. It can’t be stressed how important this stage is! Social Media – use Facebook insights and its ilk to get a broad understanding of who engages with you. Of course this will discount a great deal of the older target market, who aren’t as likely to engage with you on social platforms, but is invaluable to understand those that do. Google Analytics – Analytics gives you a great deal of data on where people come from to find you, and the Google Search Console will give you keyword terms to help you piece together these fragments. Sales Staff – perhaps the most important, the data from your sales staff is key to understanding who your client personas are. We may have all our digital tools, but nothing beats old fashioned human interaction. Personas need to contain information of not only their online habits, but also their offline habits too. Get creative with your personas to really get to the depths of who your target market is! The following will give you an example of a client archetype, though of course the extent of information you have on your clients will vary from company to company. Client 1 is a 60 year old man who very rarely uses the internet, but has a laptop nonetheless. He enjoys sports and watches all the Premier League matches through Sky Go. Well read, he has recently moved from physical papers to the Guardian app because it’s cheaper and less wasteful. He often goes on short city breaks in Europe to learn about culture and history. With a dry sense of humour, he likes people to be direct and honest and detests sales speak. Awareness – where they find out that you exist and what you do. Research – where they research you and your products to see whether you will give them what they need. Decision – where they make their decision to go with you! Loyalty – where they decide that if they need anything else, you are the company for them. 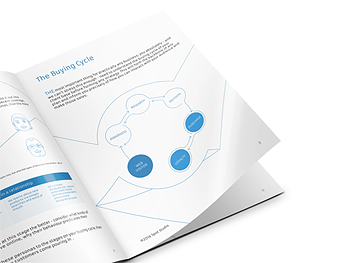 Now sit down and consider how each of your client personas would go through your buying cycle. How would Client 1 find out about you? A google search? What kind of search terms would they use? How can you ensure that Client 2 stays loyal if they don’t ever open the email campaigns you send to them? Is there another way of re-engaging with them? Key insights into your customers and how they trickle through your buying cycle needs to be the backbone of your digital marketing strategy. Without this, all you have is an idea for a business. Combining all of the above, you will need to create a strategy for content generation which will help all of your clients at each stage of your buying cycle. Sounds like a huge task, doesn’t it? Good – it is, but if you want to succeed in the long term, this is where you make your wins. So you can fully understand what we’re talking about, let us run you through a brief example. Let’s take a look at Client 1, and imagine that you sell digital cameras. An elder gentleman who isn’t exactly au fait with camera technology, his first search will be for something along the lines of ‘digital camera’. Now if you can rank here then perfect, but more than likely you won’t, and more than likely our gentleman will be overwhelmed by the choices and have no idea what the best option might be for him. As such, what you need to do is replicate the real world shopping experience as best as you can to ensure that you are giving him all the advice and help along his journey. Requiring a great deal more information on how he can make a decision, he may search, matter-of-factly for “how do i decide which digital camera to buy?”. So what can you do? You can create an article that answers that specific query and ensure that it ranks highly on Google. Write a simple, straightforward guide to help your customers understand what the tech babble actually means. Do not worry about patronising them! The market that already know this won’t end up here and will already be at the next stage. Places like Quora are always filled with people asking these sorts of questions. Just perform a little search and engage in the discussion! Offer the views of someone from your company, or a ‘layperson’ and link to your blog post to create some SEO juice as well as traffic. Hopefully you have now pointed him towards your services, but perhaps he’s now searching for a “high resolution digital camera”… Just rinse and repeat the above until you have covered all of your bases. Client 1 has decided that he wants a Nikon d800, so he searches: “where to buy a nikon d800 uk”. Your competition for this search term is without doubt going to be Amazon, eBay and Nikon. Now you have to cover your bases. Ensure that you are marked up for Google Shopping, as more than likely Client 1 is going to be clicking on the very first thing that shows up. How do you ensure you get here? Pay Per Click (PPC) advertising. Explore the options for similar synonymous search terms and set yourself a PPC budget that corresponds with your average conversion rate and profit margins. Ensure that if Client 1 does end up on your product page you give him everything he needs to make the right decision! Your website must appear trustworthy – even small icons from the likes of Trust Pilot can cause a dramatic difference. Testimonials and reviews are invaluable! Not only about your company, but about the product itself. Give him as many pictures as possible to satiate his curiosity. Make the return policy easy to read and prominent. The same goes for the costs of delivery. You’ve got them this far, so do everything in your power to not mess it up now. Make sure the purchasing process is as simple and streamlined as possible. Completely avoid additional costs, popups or anything that may make someone in the least bit reluctant or wary. This is, however, an incredible opportunity to cross sell and upsell. Give your customer the opportunity to add on accessories now; a combination purchase discount is highly successful. Ensure that you are safe guarded against abandoned carts. You can’t force anyone to stay on your website, but you can do everything in your power to collect their contact details and ensure that they don’t forget about their purchase! Employing a persistent cart and an abandoned cart email campaign is an absolute must. Hopefully Client 1 is happy with his purchase; you delivered promptly and everything was in working condition. But don’t rest on your laurels. Perhaps your customer really enjoyed using the camera, wants to use it more often and now requires a larger memory card, or additional battery. Re-engage with your client to let them know you still exist, and (more importantly), that you know they still exist and want to show them some love! Give them resources they might find helpful and discounts that are specific to them. Segmentation of your mailing list is an absolute must to create a successful re-engagement sequence!